Friday Okafor, from Okijaniha Local Government Area of Anambra State, who cooks and sells dog meat in Umuawo, a community in Oshimili Local Government Area of Delta State, proudly touts his conviction that eating sauce made with dog meat can cure malaria. This middle-aged man, who has been in the business since 1999, kills and prepares two dogs for sale everyday. His customers sold on his culinary abilities and their expectation that dog meat was a therapy for malaria. 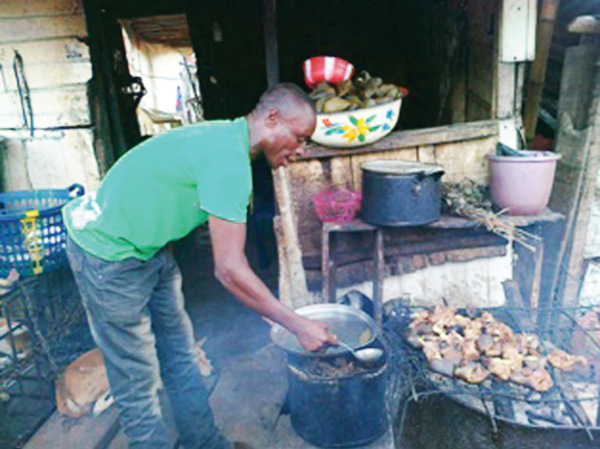 “Eating dog meat cooked with lemon grass, mint leave and some other spices certainly cures malaria,” said Mr Okafor. “Some of my customers come here to seek cure for their malaria. When they eat the dog meat and drink the water [sauce] on a regular basis, they get cured of their malaria. The water of dog is part of human being’s water. Dog is part of human being.” No need to ask the food vendor about the propriety of eating a close relative, then. But Mr. Okafor, who alleged that none of his four children and himself had succumbed to malaria in a very long due to regular consumption of dog meat, however did not doubt the fact that exposure to mosquito bite causes malaria, just as he believes that stagnant water could be a breeding ground for mosquitoes. Umuawo itself is a densely populated community of about 250,000 people which serves as a market, a beach and a major gateway to neighbouring communities. Huge mounds of refuse and unkempt environment can be said to be a defining characteristics of this sprawling community. The only source of potable water appears to be rain water, as residents have fouled the Niger River that flows through the community and also serves as place for doing their laundry and cleaning slaughtered animals. Although a sizable number of the people of the community patronise Mr Okafor, a medical doctor who spoke on the condition that his name was not mentioned in print said there was no scientific proof to show that eating sauce made with dog meat would cure malaria.